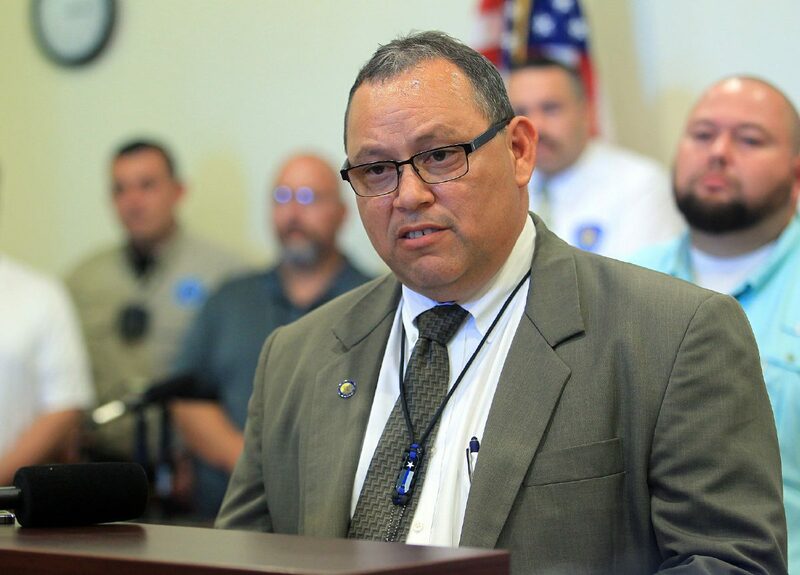 Rio Grande City Police Chief Noe Castillo reads a statement and answers questions concerning the arrest of three suspects, one of whom was a school district employee, in a drug ring that was transporting 290 pounds of marijuana in a cloned school district vehicle, during a press conference at Rio Grande City Hall on Wednesday, May 23, 2018, in Rio Grande City. 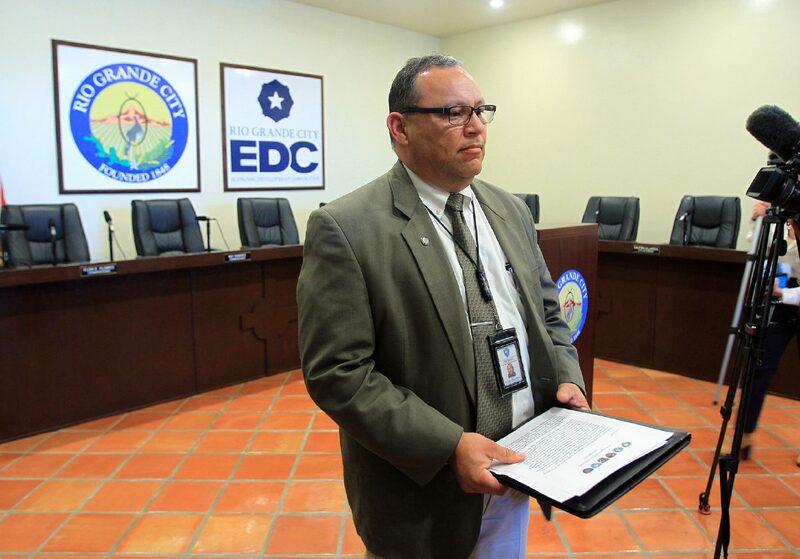 RIO GRANDE CITY — A Rio Grande City school district employee is alleged to have orchestrated a drug smuggling ring through the district’s premises, according to law enforcement officials. Mario Lopez, a maintenance worker for the school district, was among three arrested and charged with possession of marijuana in connection with the scheme, said Noe Castillo, Rio Grande City police chief and director of the Starr County Special Crimes Unit. Emanuel Peña, 30, of Rio Grande City, and Juan Enrique Medrano Jr., 28, of Edinburg, were the other two arrested in the scheme. The arrests occurred after the SCU, in coordination with the Starr County HIDTA Taskforce and the school district’s police department, conducted an operation at Fort Ringgold, a historic military compound where several administrative buildings and two elementary schools are located. 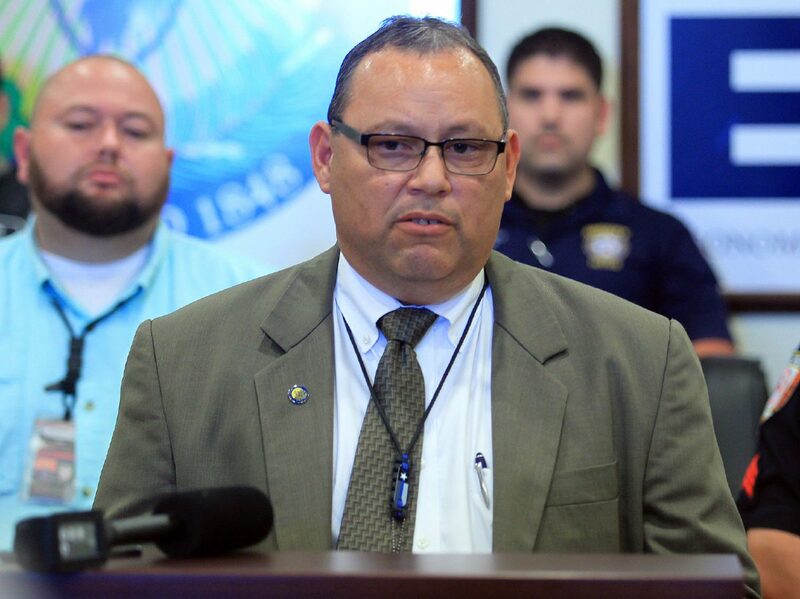 Rio Grande City Police Chief Noe Castillo reads a statement and answers questions concerning the arrest of three suspects one of whom was a school district employee in a drug ring that was transporting 290 pound of marijuana in a cloned Rio Grande City CISD vehicle during a press conference at Rio Grande City Hall on Wednesday, May 23, 2018 in Rio Grande City. Castillo said the drugs were then loaded onto a cloned school pick-up truck marked with official school district magnetic decals. Officials located that pick-up truck at a residence from which Lopez was seen leaving in the school district van on Tuesday. Once back at Fort Ringgold, Lopez fled on foot causing the lockdown of the two elementary schools. He was not located but he later turned himself in Wednesday afternoon. Peña and Medrano fled from the residence in a maroon GMC Yukon but then collided with an undercover HIDTA unit. The suspects continued to flee and then crashed with another vehicle. SCU investigators arrested Medrano, who was riding in the passenger seat while Peña fled on foot. However, he turned himself in a short time later, Castillo said. Peña was charged with evading arrest in addition to the possession of marijuana charge which is a second-degree felony. Castillo said 290 pounds of marijuana were found under the plywood in the bed of the pickup truck. Medrano is the only one that remains in custody as of Wednesday afternoon, according to Major Carlos Delgado, spokesperson for the Starr County Sheriff’s office. He could not immediately provide details on Lopez and Peña’s release. It remains unknown how long the scheme had been operating, according to Castillo, and the investigation is ongoing.